Among the many weapons first used successfully in combat during the American Civil War, one of the most successful has to be the torpedo. What we would commonly refer to as a mine today, torpedoes were often nothing more than beer casks filled with gunpowder, placed on land or in the water, and detonated by remote electric detonation or pressure triggers. These weapons resulted in multiple casualties and the loss of several vessels on both sides. Another less successful method of employing the devices was in the method of “spar torpedoes”, which basically amounted to “bombs-on-a-stick”. USS Spuyten Duyvil was contracted, built and launched in mid to late 1864. She was unique in that she carried multiple torpedoes and spars, which could be reloaded inside the ship’s hull and deployed through a clamshell door below the waterline. She saw service on the James River, just outside of Richmond, as part of the Union blockade. While she never used her torpedoes in combat, she did use them to destroy obstacles in the James River during and after the war. Post-war she was utilized in much testing, but simply disappeared from the Naval Register in 1880, likely scrapped or sold-off. 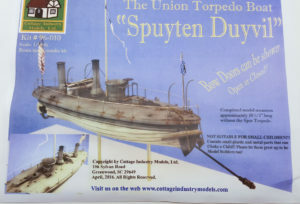 The Cottage Industry Models’ kit of USS Spuyten Duyvil is in 1/96th scale resin, and just over 10” in length. 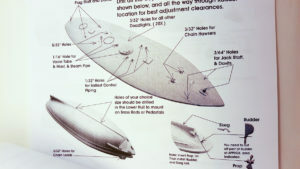 As shown in the photos, the upper and lower hull are cast in resin, as are other details such as the rudder, stacks, cockpit, ship’s boat, torpedo, and the clamshell bow doors. White metal castings provide the propeller, anchors, ship’s wheel, bitts and chocks, and other fittings. A wooden spar and metal link chain are included, as well as printed flags. Honestly there isn’t much to this kit, and it should prove an easy build. The upper and lower hulls fit together quite nicely and will require little clean-up. My sample has little to no evidence of air bubbles in either resin or metal parts. The instructions are full-sized 8.5 X 11” sheets, with close-up photos and detailed drawings and annotations as to what goes where and how to assemble it. With its simple parts, and large (for ship modelers) scale, this should be a quick and fun project. It’ll make a quick weekend build for someone that wasn’t something unusual on the shelf, and if you’re if the mind to go really nuts and super-detail the model with an interior, there’s plenty to work with here. Recommended for anyone looking for something unique and easy to build. You can read more on the Spuyten Duyvil HERE and find the model HERE. You can also find my NYT article on torpedoes during the Civil War HERE.